Our canine friends with the short noses that sometimes snort, but always look adorable, need some attention to their diet. Like most small breeds Shih Tzu’s don’t require a lot of dietary maintenance but there are some general guidelines for long-term health. If you have found yourself wondering, of all the options out there, what is the best dog food for Shih Tzu then you are in luck! As it happens, we’ve done all the digging for you and found a number of options that can help you and your dog. Shih Tzu’s have some quirks about them and it comes down to a few recurring breed issues. Not issues with breeding don’t get us wrong. We mean, poor Shih Tzu’s can experience hot spots, itchy skin, and a ton of digestion issues that no one wants to see their pet go through. Which option is the winner? We have five recommendations here that are all great options for any Shih Tzu owner. A few of these are breeding specific but we’ve found that often the issues that Shih Tzu’s have to affect many small breeds. This means there is a lot more variety in quality food for your pet. All five options bring something different in terms of options and what their purpose in design and formula is. From the over commercialized war on grain to the constant pursuit of density rich proteins that can also maintain a healthy weight. As pet owners, we are constantly seeking the best food for our pets and find ourselves in the middle of contradictions. These brands though are about transparency and being upfront about what they can and cannot offer. Blue Buffalo offers a strong line of dog food’s that are focused on high protein diets made from high-quality ingredients. As one of the leaders in raising awareness of grain products in the dog food, you can be sure that anything in Blue Buffalo needs to be there. So, what do you need to know about Blue Buffalo’s Life Protection? Blue Buffalo means business. As one of the brands raising awareness in what is actually in dog foods currently on the shelves they make a point to keep their ingredients list simple and impactful. What did not we like? Well, although Blue Buffalo campaigns for healthy ingredients they miss out on a lot of options that would make their food more nutrients dense. Meaning that your dollar can go a lot further with another brand. Straight from a chef that most of us at home would be enthused to have been cooked for, this recipe is built on natural ingredients. Hence the name, Nutrish Natural. 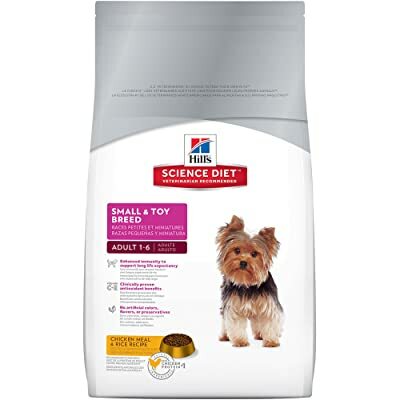 Although this isn’t for one specific breed, it offers a lot of what we were looking for when we set out to find the good dog food for Shih Tzu’s. The ingredients here are chosen to promote energy, build muscle, and aid in digestion. On top of all the good things it does for your dog, a part of the proceeds of your purchase goes towards the Rachel Ray foundation. This foundation helps animals that need it the most. Who wouldn’t feel good about buying a bag of this? This formula is meant to be small and toy breeds. This means that although it isn’t necessarily specific to Shih Tzu’s it is going to come to a lot closer to meeting your dog’s needs than a more generalized option. What are the highlights of Science Diet? Science Diet has a lot of claim to its name. If you’ve ever adopted a puppy from the pound, odds are they started you out with a bag of Science Diet. This is also one of the most recommended brands by veterinarians. The only breed specific option on this list is from the Royal Canin breed specific line. This line stands out not just because of its high quality. Royal Canin has a reputation for identifying key issues that each breeds experiences and attempting to find innovative solutions for them through diet. Who knew that these issues could be addressed through diet? Often small breed dog owners face the struggle of a low or even non-existent appetite. Then, top it off coat maintenance for Shih Tzu’s can become difficult. Because of their two-layer coat system, it can appear much healthier than it actually is at the root. 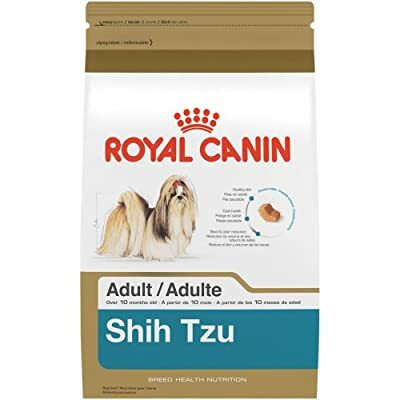 We could not find a downside to Royal Canin’s Shih Tzu formula. Merrick’s formula is grain free and all natural. These are two great benefits that dog owners are looking for these days. What we are looking for past that is food that is nutrient dense. Well, Merrick delivers on this! Merrick’s recipe is very high protein and high fat. This is great for healthy, shiny coats. But if you’re a concern for your pet is weight gain then Merrick’s might not be for you. But the food itself is very nutrient dense. Tons of vitamins, high in fiber and really nothing bad. The meat is regionally sourced from Texan farmers and then they rely on fruits and veggies to fill in everything else. The downside that we see with Merricks? Well, this really isn’t a reasonable price. If Merrick was more breed specific and offered a lot more for Shih Tzu’s we would love to recommend this even more. Rachel Ray really stepped up the low-priced dog food when she brought this line the ingredients are all easy to read and transparent. There is also added minerals and vitamins too. Rachael Ray delivers simple ingredient lists that are only comprised of quality, nutrient dense, proteins. There isn’t meal, wheat or gluten additives which try to take the place of food with a high nutritional quality. Although this particular brand isn’t grain free, for those with Shih Tzu’s that do have grain allergies there is a grain free option. For the non-grain free or standard, and varieties only whole grains are used. So your dog is still getting all the energy and nutrition they should from their food. One of the many benefits of the near overload on Omega-3 and Omega-6 fatty acids is the shiny coat. Shih Tzu’s have wonderful coats that can be sleek and soft. However, a bad diet can change that really quickly. You don’t want to see your Shih Tzu with tangled or matted hair. 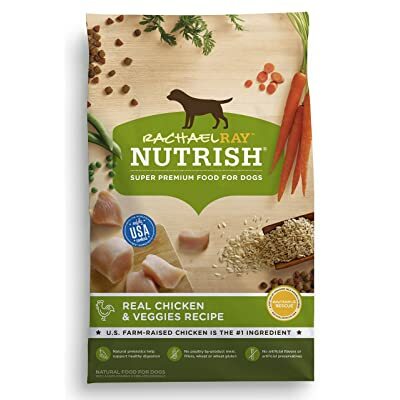 Rachel Ray is a great option if you’re looking for something that will have the chance to improve your dog’s coat. Royal Canin works diligently to identify areas where your dog’s diet could be improved so their lives can be improved. They focus on looking at aspects such as dental and coat health of the breed. Royal Canin has identified that Shih Tzu’s coats have two sections. The first, closest to their skin, is almost fleece like. This makes them great for cold weather and explains their origins it can make an unhealthy coat appear to be in better condition than it actually is. The bottom fleece like a portion of their coat can also mask skin conditions. But, their top coat is long, smooth and silky. Royal Canin steps in to help maintain a healthy coat through healthy, fatty acids. But the natural softness doesn’t start with fatty acids. It starts with healthy skin. This gets a boost from the complex nutrients, EPA, DHA and vitamin A in this formula. The goal here is healthy skin, healthy coats. The short and broad snout that Shih Tzu’s have can make them lazy eaters. Although most dogs will inhale a bowl of kibble without a second thought it is a little different for Shih Tzu’s. The difficulty that Shih Tzu’s have when they eat is positioning and grabbing onto the kibble itself. Lazy eating is only one part of their low appetite. Nonetheless, Royal Canin has a kibble that is designed to be easy for Shih Tzu’s to grasp. This eliminates two issues: lazy eating and disinterest in food. This is slightly higher in fat and lower protein than the other formulas on this list. But, it also has more fiber which can aid in a number of digestion problems. With an AAFCO seal of approval whether you are a new Shih Tzu owner or your friend has been around for a while you know this is a good option. We mean it. This formula starts from ingredient number one with a focus on meeting the needs of small and toy sized dogs. Then they just keep going. The kibble is small and not as hard as most adult dog food kibbles. This is great for dental health and helps to promote chewing. The overall effect here is that small aspect of kibble size could have an impact on your pet’s longevity. Much like Rachael Ray’s Nutrish Naturals, Science Diet also donates based on every purchase. Science Diet uses a portion of what you paid per bag to help animals that are currently in shelters. Science Diet also relies on ingredients that are resourced here in the United States. Additionally, the dog food is made right here in the USA. Unlike the others on this list, the first ingredient is not real meat. Instead, it is “meal” which means that it is made of by-products. Much like a chicken nugget, and although there isn’t anything wrong with chicken nugget’s you certainly would not eat them as your sole source of nutrition. But that’s not it in the downfalls section. See Science Diet is actually kind of pricey for what you are getting. You are not getting real meat and you’re not getting high-quality veggies. You are also not getting a grain free option which is becoming increasingly important to some pet owners. We have also found that some dogs have allergies, particularly to Science Diet’s ingredients. Although there are a number of great things about this option, there are some downsides as well. We have done all the research and have found that anything a Shih Tzu owner could come across. They took the delicate nature of the Shih Tzu coat and found ingenious ways to make maintenance easier. Through diet and design, they are attempting to eliminate low appetite, and ease eating for your dog. There is a drive for Shih Tzu’s to have a perfectly balanced diet through building on high quality, lean proteins, and heavy-duty fibers. It is a great option and definitely worth any pet owner’s time to evaluate how it fits in with their health objectives. Although some pet owners want more variety and maybe battling pets picky eating habits this can lead them to pursue other options besides Royal Canin. However, for most cases, we recommend Royal Canin’s breed-specific dry dog food for Shih Tzu’s. There you’re not supposed to give your dogs green peppers. Green peppers are very hard to digest for humans. Absolutely should not be given to a dog.Because green peppers is very harmful for our dog health﻿.Tkanks for your advice and block.